Donald Campbell Anderson. 73, of Easton, passed away at home, Saturday, September 17, 2011 after a long battle with prostrate cancer. Born: February 24, 1938 in Drexel Hill, Pennsylvania, Donald was the son of the late Elwood C. and Evelyn Dellinger Anderson. Personal : Donald was married to Ann Helwick Anderson, commemorating fifty years of marriage earlier this month. 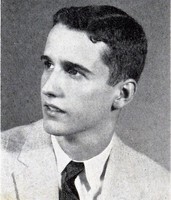 He was a 1956 graduate of Easton High School and Penn State University in 1960. He was formerly employed by the F. W. Woolworth Company as a district manager, resigning in 1973. He owned and operated three clothing shops, Eagle Youth Center Children’s Clothing, after which he successfully pursued various financial ventures. He loved to travel and was a passionate sports enthusiast, especially of Red Sox baseball and Penn State sports, particularly football. He followed Penn States teams to both home and away games for many years. Another special interest of his was history, especially of railroads, enjoying the research for historic train locations in Pennsylvania and elsewhere. His greatest joy was following the sports activities of his beloved grandchildren and providing unending enthusiastic encouragement to all of them. Membership: Don was a long time member of College Hill Presbyterian Church, serving on various boards through the years. He also did various volunteer work, most recently with ProJeCt and Meals on Wheels. Survivors: He is survived by his wife Ann Louise Helwick Anderson; twin sisters Carolyn Bloom, and Virginia Gerspach and her husband David of Easton; sister-in-law Carol Helwick Stack and her husband Robert of Guilford, Vermont; a son Scott Campbell Anderson and his wife Angela of Easton; a daughter Kimberly Wismer and her husband Austin of Easton; grandchildren: Scott C. Anderson, Jr., Duncan C. Anderson. Graham C. Anderson, Alexandria Wismer, Kaltlyn Wismer and Austin wismer, Jr., all of Easton; and many nieces, nephews and extended family in southwest Virginia as well as the South Carolina shore area.